First NYC Event Series Profitable For Brit + Co.
Brit + Co wrapped up its first event series in New York a few weeks ago. The company reports the experiential event, called #CreateGood, was profitable. 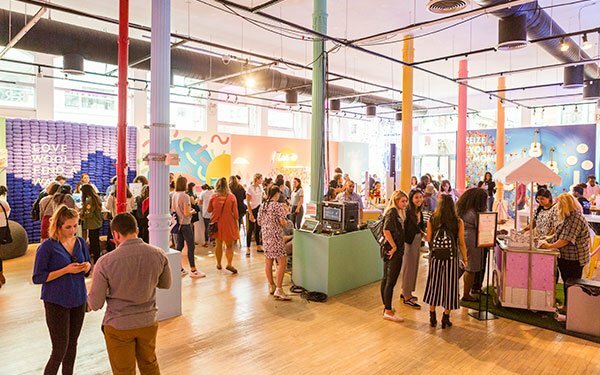 Brit + Co, a digital media company aimed at millennial women with DIY and lifestyle content, told Publishers Daily over 10,000 people attended the five-day pop-up event. More than 1,200 showed up for the six ticketed events. Tickets went for about $20. The other seven events, which ranged from workshops to parties, were free. Partners for the event included Kia, Lyft, Sorel and Talenti. The event also spurred digital growth for Brit + Co. Twenty videos were created from the event, such as talks filmed on stage with Girls actress Allison Williams and female principal dancer at the American Ballet, Misty Copeland. Those videos have raked in 2.7 million impressions, and over 830,000 views so far, per the company. Other digital content created around the experiential events includes editorial features on some guests. An article about Williams has 66,000 page views. “By providing both a beautiful visual experience and inspiring programming, we are tapping into the next phase of experiential events,” stated Brit Morin, founder and CEO of Brit + Co. This generation of women, she added, wants "a shareable experience and one that helps them personally and professionally grow." The event space in SoHo had an entire section devoted to sharing on Instagram — women lined up to get into rooms adorned with funky decorations and meme-like phrases to post selfies on the social platform. This event series springboarded off Brit + Co’s annual Re:Make Summit in San Francisco. This year, the company raised a $15 million Series C round of funding, led by Verizon Ventures. Originally a DIY-focused site, Brit + Co now covers other women’s lifestyle categories, such as fashion and parenting. The company wanted an event to reflect its expansion into these new areas, as well as reach an audience outside of San Francisco, where it is based.